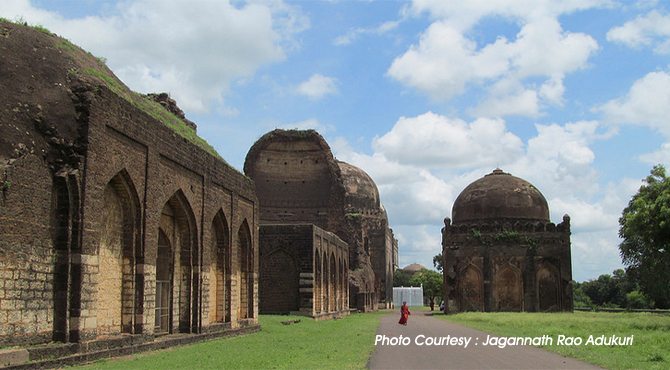 Bidar town, on a red laterite plateau in Northern Karnataka is known for its fort, mosques, tombs and madrasa. Once the capital of the Bahmanis and their successors, the Barid Shahis, Bidar was the erstwhile abode of Vidura, the minister of the famous epic Mahabharata. The description of Bidar begins with its magnificent fort known as Bidar Fort. Originally built by the Bahmanis, the fort and its various features were rebuilt under the Baridis. The ninth Bahmani Ahmad Sha I, shifted the capital of the Bahmani empire from Gulbara to Bidar in 1424, rebuilt the old Hindu fort and enriching the town with beautiful palaces and gardens. Now an archaeological area, this impressive fort stands in the central location in the Deccan and the town sprawls within and outside its crumbling walls, in places retaining its medieval charm. Surrounded by undulating green hills, the fort walls stretches for a distance of 10 km with strategically placed bastions and towers. The fort complex house is vast which contains royal palaces, mahals, some armouries, living quarters, a jail, a mosque, numerous wells and other sundry buildings. The fort can enter through a line of gates in the southeast quadrant of the fort and a draw bridge over the moat to the South. The intermediate Sharza Darwaza (named because of the sculpted animals set into the facade) and the inner most huge Gumbad Darwaza are main entrance gates to palace complex. Probably built by Ahmad Shah Wali in the 1420's, the Gumbad Darwaza has Persian influence. From here one can see the fort, surrounded by a triple moat hewn out of solid red rock. Inside stands a huge old banyan tree and by its side is the Rangeen Mahal (Coloured Palace). Muhammad Shah built this, after the Abyssinians attack in 1487 forced him to movie to a safer side inside the fort. One of the best preserved palaces at Bidar, it has elaborately decorated with coloured tiles, later enhanced by Ali Barid with mother of pearl on polished black granite walls and on intricate wood carvings. The palace can be enter through an arched gate. The palace has a rectangular court with a small pond in the middle. The next important building to be seen, the Solah Khamb or Zanani Mosque. Built by Qubil Sultani in 1423-24 AD, it is the oldest Islamic building in Bidar. From a distance, one can see its impressive sight with its huge central dome rising above a long length of arches. Served as the principal place of worship, only the prayer chamber stands now. It is so called because of the 16 pillars at the centre of its prayer chamber. Visitors have no access to the interior as it is locked. The Mosque faces east onto a rectangular garden known as Lal Bagh, with water channels and a fountain. Adjacent to the mosque, there are palaces that merit a visit like Tarkash Mahal, Gagan Mahal, Takht Mahal letc. Famous for its Stucco work, Tarkash Mahal is situated south of Lal Bagh. It is built for the Turkish wife of a Bahmani sultan of 14-15 century AD. It has an upper storey that is reached by a flight of steps. The Gagan Mahal, which lies beyond was built by the Bahmani sultans during the 14-15 century AD. It is an elaborate residential complex with vaulted chambers. It is believed to have allowed the ladies to watch animal fights in the moat below from the roof. The nearby Archaeological Museum is worth a visit. Entry is free. The Diwan -i- Am (Hall of Public Audience) is situated a short distance west of the mosque. It was also known as Jali Mahal, because of its trellis work. It has a large rectangular court, flanked by high walls. To the north stands the Takht Mahal or Throne chamber, where the Bidar rulers held private audience. It has an audience hall, a swimming pool, royal apartments as well as coloured tiles and rich decorations. The central courtyard has a well maintained garden with floodlighting at night. Another interesting feature inside the fort is Hazar Kothri, where one can see underground rooms and passages. Near to this is Naubat Khana housed the fort commander and the musicians. The road west from the royal apartments leads to the encircling for wall with bastions carrying vast canyons. The outer fort walls extend for miles and a few ruins can be seen.